You Are a Novice The aftermath of a car accident in Lancaster can certainly be a complex, far-reaching web of he-said, she-said. As a result, the process can get overwhelming very quickly, particularly to the uninitiated. There are steps that must be taken to file a claim against the insurance companies for damages. Don’t know the first thing about filing a claim? Unsure of the game that ensues when going back and forth about the amount? A skilled car accident lawyer knows just what to do and when to do it. If this is the case, an attorney can help you. If you donâ&#x20AC;&#x2122;t at least contact one for a free consultation, you could run into some roadblocks throughout the process that could prevent you from getting what you deserve, such as taking a too-low amount too soon or failing to file a document by the deadline. There are many pitfalls that can come up when trying to get financial compensation in your car accident case. A skilled car accident lawyer knows just what to do and when to do it. You Have Long-Term or Permanent Disabilities Many injuries sustained in a car accident can hold long-term and even permanent consequences. In deciding how much to compensate you, the insurance company will look at three main factors: the type of injury sustained, the estimated timeline of recovery, and current and projected medical bills. Often, as you attempt to prove your injuries are severe enough to pose long-term or permanent disability, you will likely find yourself in a war of sorts with the insurance company. Their job is to disprove you and give you the lowest amount they can get away with. 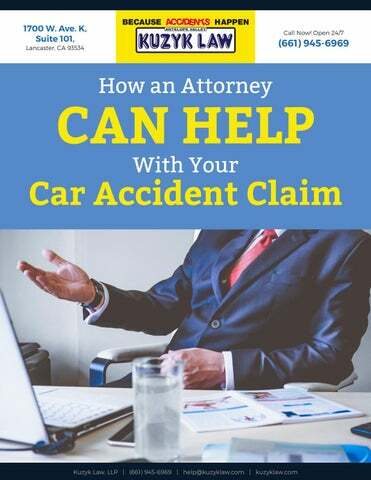 Your car accident lawyer, on the other hand, works hard to get you every penny, backed by a strong network of medical and other professionals who will help prove the extent of your disability. Contact Kuzyk Law For A Free Consultation! When the insurance company sees that you are bolstered by a lawyer, they will stand up and take notice. There is Disputed Liability As we said above, the insurance company can and will question your liability. This may seem like a personal attack, but it’s really just common practice. It can be easy to take offense, get flustered and retreat because you’re unsure of how to resolve this issue. You may get so frustrated that you just take whatever they offer you. This is what they want you to do. When you accept their initial offer without a fight, this will guarantee the end of your case and your ability to fight for further money. When the insurance company sees that you are bolstered by a lawyer, they will stand up and take notice. The Insurance Company Refuses to Pay a Fair Amount When you attempt to file all those forms on your own (and believe us, there are A LOT! ),it’s very easy to miss one of the requirements or deadlines. These are all loopholes the insurance company can use to refuse to pay up. Your car accident lawyer can stay on top of those deadlines, make sure you’re paid what you deserve, and rectify all issues. Call Kuzyk Law Right Away For A Free Consultation! When you attempt to file all those forms on your own, itâ&#x20AC;&#x2122;s very easy to miss one of the requirements or deadlines. The Adjuster Proposes an Offer Itâ&#x20AC;&#x2122;s second nature to take insurance companies at their word and accept the first settlement offered. This can be a grave and long-lasting mistake you may regret for a lifetime. The insurance companies know most car accident victims will shy away from the complicated process of having to deal with the red tape involved. However, if you suffer from extensive injuries and must take time out of work, you require a car accident lawyer who can intervene on your behalf, reject that first offer, and go back and forth until the amount you see on that paper is fair. Contact Kuzyk Law If you have been in a car accident in Lancaster, call Kuzyk Law now for a free consultation at 661-945-6969.